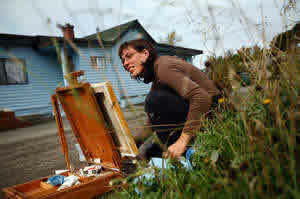 Bellingham Herald – September 29, 2008 | Ruthie V.
Artist Ruthie V. (aka Sarah Ruth Vergin) balances her career as an artist with her other job as a architectural color consultant. “Artists who choose to live here make a lot of sacrifices. Most artists have a job to support their art. Very few artists are able to make art their full time labor. Bellingham is a special place, and because of that, some people make financial sacrifices so that they can live here. “Those few left that are making art here make a fraction of what they could make in a city like Seattle. “I’m very fortunate to love the other half of my career just as much as making fine art. When I’m not painting I’m consulting on paint. I’m an architectural color consultant. I develop personalized color palettes for people’s homes and offices. One of my projects – Matthei Place at 15th and Harris – will be featured in Cottage Living magazine next year. Color consultations are wonderfully complicated, and infinitely rewarding. I love that I can use a simple gallon of paint to make people fell good where they live. “I’ve learned to be very creative – not just in my paintings, but in how I apply my art to the community. “By developing shows in conjunction with local non-profits like Sustainable Connections and Kulshan Community Land Trust, I am able to create paintings that come from my heart, and make a difference in my community. The last show I had was called “The Humanity of Land” and was about our food, local farms, and farm workers. The show was at the beautiful Smith & Vallee Gallery surrounded by the Skagit fields in Edison and a portion of the proceeds went to Sustainable Connections’ food and farming programs. The show was wonderfully successful. I was able to try new things like texture and bold brush strokes. I worked with imagery that was different than I’ve worked with before, and I put seeds and soil and straw into paintings. “The community supported my work by showing up in masses. They understood what I was talking about, and they were deeply involved. The show sold well enough to earn a generous donation to SC’s farming programs, and provided me with enough income for me to do it again!